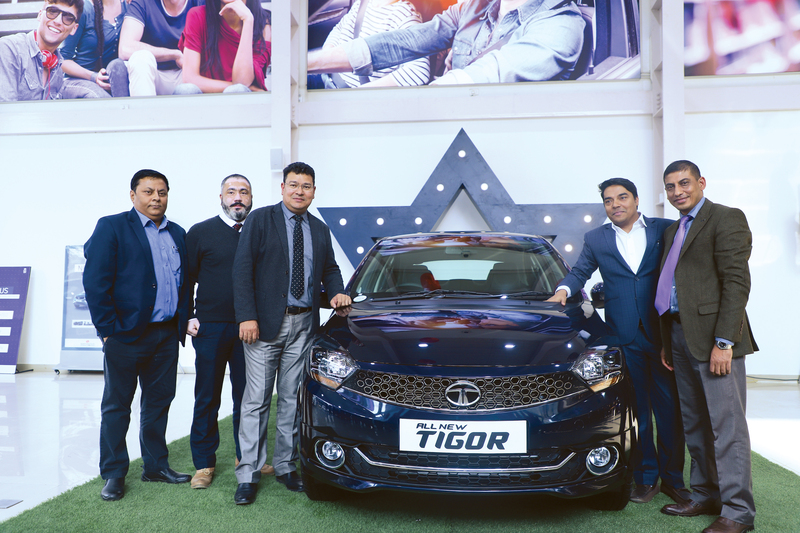 Bringing in yet another fantastic product to the passenger vehicle market, Tata Motors, along with their sole distributor for Nepal, Sipradi Trading Pvt. Ltd., today announced the addition of their next generation compact sedan, the all-new Tata Tigor. With exclusively styled interiors and exteriors, this premium compact sedan will be available across all Tata Motors authorized sales outlets at starting price of NPR 27.55 Lakhs for the petrol variant (powered by the 1.2L Revotron). Premium Exteriors: Adding to the exterior design elements, the new Tigor with its break free coupe-like roofline and dual chamber projector headlamps with sparkling chrome finish exudes immense style. The 15” alloy wheels are offered in an impressive dual tone colour scheme and the ORVMs get LED turn indicators with auto fold function. It will be available in 6 exciting shades - Egyptian Blue, Roman Silver, Espresso Brown, Berry Red, Pearlescent White and Titanium Grey. Plush in-cabin experience: Complimenting the stylish exteriors, the interiors of the new Tigor have been crafted with extreme finesse. Premium black and grey interior theme coupled with titanium color faux leather seats, premium knitted roof liner and rear armrest with cup holders, which come as a standard feature; provide the car with a luxury feel. Indulgent comfort: Making for a comfortable and luxurious ride for all occupants, the car offers height adjustable driver’s seat as standard feature for the perfect driving position, scooped out front seat backs for more legroom, class leading head and elbowroom for the rear passengers. It also comes equipped with a fully automatic temperature control (FATC) with uniform cooling all around the cabin, a boot space of 419 ltrs with wide and clear opening using an innovative 4 bar mechanism and 24 intelligent spaces for carrying a lot more on the move. Next generation HMI and user experience: With a 7” capacitive infotainment with Android Auto from HarmanTM, the new Tigor comes equipped with 4 speakers and 4 tweeters, helping provide its cabin inmates with an exemplary surround sound experience. Every detail of the sound system has been precisely tuned by Harman golden ear certified auto experts to maximize the interior acoustics of each specific cabin, taking a leap towards auditory perfection and setting new standards for the ultimate in-cabin listening pleasure. Supreme Safety: At Tata Motors, safety has always been at the forefront. Reinstating the same, the new Tigor holds an energy absorbing body structure made using high strength steel. The car also comes with a safe and reliable architecture with cocoon like safety cell for its passengers, dual airbags as a standard feature and Anti-lock Braking System (ABS) with Electronic Brakeforce Distribution (EBD) and Corner Stability Control (CSC). powertrains. This engine has been further refined and optimized to deliver better performance and lower NVH. Improvements have also been done in transmission assembly to reduce vibrations. Multi-Drive Modes continue to be offered as part of the Tata Motors’ product DNA to ensure a comfortable and pleasant drive experience. The new Tigor will come in 4 variants - XEO, XMO, XZO and XZ+.